© Point of View by Chris Stein, Rizzoli, 2018/Photography © Chris SteinThroughout the 1970s, Blondie guitarist Chris Stein took photographs documenting the downtown New York City music scene, and now a new book featuring a wide range of those images will be published in the fall. Point of View: Me, New York City, and the Punk Scene will be released in November 2018, and will boast pics ranging from self-portraits to candid shots of such celebs as Stein’s famous band mate Debbie Harry, artist Andy Warhol and author William Burroughs. The book also will feature photos depicting life in various locations of gritty downtown Manhattan, including children sitting on stoops, dilapidated buildings, graffiti-covered subway cars and the club scene of the Bowery. 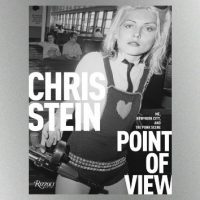 Point of View is a follow-up to Stein’s 2014 photography book, Negative: Me, Blondie, and the Advent of Punk. In other news, Blondie will give a headlining performance on July 20 in New York City as part of the House of Vans Brooklyn summer music and art series. The band is curating the event, and in conjunction with the series, they are creating a visual art experience that will feature an exhibit of some of the photographs that will appear in Stein’s Point of View book. The show will also feature acclaimed indie-rocker Liz Phair and an unsigned musician named SASAMI, who was formerly the keyboardist in the band Cherry Glazerr.